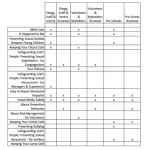 Effective July 1, 2015, Pennsylvania law will have new requirements for the clearances necessary for employees and volunteers who work with or come into contact with children. The new law also requires that employees and volunteers are considered mandated reporters of suspected child abuse. The diocese is asking that current clergy and employees come into compliance by December 31, 2015. Clearances need to be renewed every 60 months. Congregations are required to see original documentation and maintain records of their volunteers’ and lay employees’ compliance with these guidelines. All original records for clergy will be kept at the Diocesan office. Records for parishioners and lay employees should be kept securely at each parish. Please contact the diocesan office with any questions regarding compliance. Recently the state of Pennsylvania updated who they use for the fingerprinting process. To register for the fingerprinting you need to go to IdentogGO From there you can schedule your appointment to complete the finger-printing, find out what you need to take with you to the appointment and find a location to complete the fingerprinting. The service code is 1KG756. In the Diocese of Bethlehem we are committed to establishing and maintaining safe environments for children in our congregations and church buildings. All parishes are required to adhere to the Diocesan Policies for the Protection of Children and Youth from Abuse adopted by Diocesan Council, which are available for download. Diocesan Policies (updated January 2009) and accompanying Field Guide. We offer training in Safeguarding God’s Children through programs developed by the Church Pension Group. Safeguarding Training is done online. Please complete the Safeguarding Online Training request form (fillable PDF) and email to the Diocesan Office.